On time! Thank you for taking care of my family as I wasnt able to go. They enjoyed their time in BKK! Thank you! Our group of 4 adults used the services of Swai and a very nice driver (sorry, cannot remember his name) for transportation from a hotel in Bangkok to our cruise ship port at Laem Chabang. They arrived for pick-up on time despite high traffic for a Bangkok holiday. Swai worked with us to plan an itinerary of attractions along the way that we liked, and adjusted it as needed when it started to rain. Swai's English was good and his humor was appreciated. Highly recommend! Swai was a wonderful guide. Rather than coming with a prescribed itinerary, he was interested in obtaining our input about what we wanted to see.He was very professional and informative. He encouraged us to ask questions and answered all of them. He went out of his way to point out interesting things. He knew we were interested in food, and took us to several interesting markets and pointed out various Thai ingredients and food items. We booked a tour only a few days before going to Bangkok. We are so glad we did! It is a great way of seeing all the attractions Bangkok has. Swai our guide was very informative and enthusiastic. We would use toursbylocals again. We had a great time with Swai. Very accommodating, flexible, and professional. Highly recommended. I'd rate Swai a 6 out of 5. Fantastic guide! SWAI is a fantastic tour guide. He picked us up timely from our cruise ship and planned a terrific tour for us in Bangkok. Time is limited so he made the best use of time. He's a great personality, is very friendly and has a desire to please. Would definitely recommend him to anyone. The six of us had a great time thanks to him. TOUR GUIDE RESPONSE: The trip was started at 08:30 a.m. and spent driving time a few hours to arrive the central of Bangkok. The road traffic was so very heavy. And it had to consider the driving time back to the cruise ship because the cruise ship would leave at 6:00 p.m. on the same day. So after a break of lunch, it was almost 1:45 p.m. That was so late to visit anywhere elses. The group had to head back to the cruise ship and arrived at 4:20 p.m. Thank for the visit and very welcome to come back again in the future. Swai was very knowledgeable and helpful with good English skills and a pleasure to spend the day with. We had a delayed start because of a misunderstanding about group size, hence 4 stars instead of 5. I wouldn't hesitate to recommend him. TOUR GUIDE RESPONSE: Thank for your kind review. It was so great honored and so happy to work on the tour. Swai is probably the most professional tour guide in Bangkok. He was prompt on picking us up at the port, which approximately 2 1/2 hours from Bangkok and returned us to the ship on time. We used his services foe two days and he set up our tour on what my wife wanted to see. We felt most comfortable with his driver. There is lots of traffic in Bangkok, so Swai will make sure you arrive at your destinations on time. TOUR GUIDE RESPONSE: Thank for your review It was a great pleasure to tour for you and your wife. The trips were covered the highlight of Bangkok on the first day and the floating market on the second day. There was a scheduling mixup with the guide I previously selected but I lucked out and was set up with Swai. Swai was great! He was so informative about the culture and history. I saw so much on my tour and he was extremely accommodating to make sure I saw what I wanted and more! I had a fantastic tour. TOUR GUIDE RESPONSE: That was so great pleasure The tour was covered Bang Pa-in Summer Palace & Wat Niwesdhammaprawat; Wat Phanancherng; Wat Mahathat; boating on the river and Wat Chaiwattanaram. Swai did an amazing job for us! We enjoyed the indescribable Grand Palace, a local ferry ride, a market, the Emerald Buddha, the Reclining Buddha, a fun tuk tuk ride, the Golden Mount, and several ethnic treats. He even found us inexpensive and cute "modesty kits" for the temples. We were so impressed with all he was able to show us in such a short amount of time, and yet he was so careful to ensure we were back to our ship with time to spare. TOUR GUIDE RESPONSE: It was a great pleasure. Tour was led to Bangkok from Laem Chabang Port. The trip was to the main highlights of Bangkok : the Royal Grand Palace & the Temple of the Emerald Buddha; the local market at "Wang Lang"; the experience of the local Took Took ride; the Temple of Dawn and Wat Pho & the Reclining Buddha. Enjoyed our tour of the national park today with Swai. We went in a big group of 14. Swai was attentive and there was ease of booking the tour. The kids enjoyed his guided tour a lot. He was also flexible to meet our needs and very personable. Will definitely book another tour with him if there's an opportunity in the future! TOUR GUIDE RESPONSE: Thank for your kind review. It was my great please to have chance touring for your family and your group. Swai was amazing, even though I think he was as amused by our choices of things to visit. He helped us see and try all the things we had hoped for and then some! Not only is he kind and funny, but an infinite well of knowledge about the culture and history of Bangkok. Thank you Swai for taking us safely, swiftly, and without complaint on our grand albeit odd adventure! There was little information of value provided. We had to pay for the boat. We didn't get to see what happens at the train market when the train arrives. TOUR GUIDE RESPONSE: Please accept my apologies that my commentary throughout the tour was not up to my usual standard - I had incorrectly assumed that you wanted some quiet time during the tour. I will try to gauge my customers' interests better in future. As per the tour description the boat ride is not compulsory, and just an optional extra. Thank you for your feedback. TOURSBYLOCALS RESPONSE: Please accept our apologies that the tour was not more customized to your interests. Please also note that the additional cost for the boat tour was correctly detailed in the 'What's Extra' section of the booking form; this is an optional extra to allow flexibility regarding the transport. 5 stars out of 5!! Our tour guide, Swain, was outstanding! English was excellent and very accommodating! Thank you for an excellent day!!! 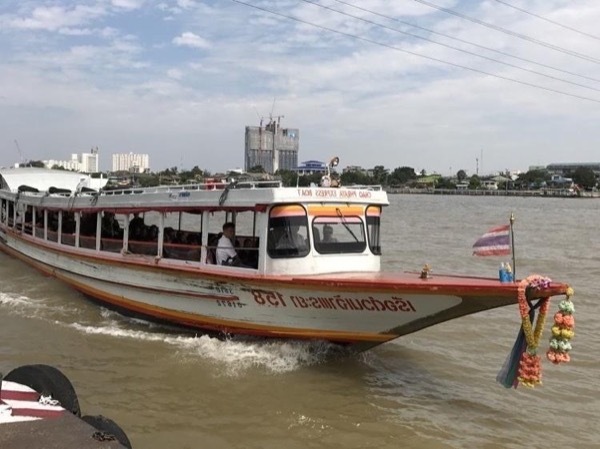 TOUR GUIDE RESPONSE: The tour was started from the cruise ship in Bangkok at Khlong Toei Port on the route for the attractions in Bangkok with the last stop for shopping at Jatujak Weekends Market (or Chatuchak), then returned back to the cruise ship. It was so great pleasure to do the tour and very welcome to Thailand in case to revisit again in the future. Swai was challenged to help me due to my physical disabilities, and he did his best. I did appreciate what he did for me. TOUR GUIDE RESPONSE: On 10th January 2017, it was unfortunately raining in the wrong season but the trip was started to meet you at Central World. Then we transferred by a taxi to the nearby attraction in Siam Paragon for Sealife Ocean World. The cruise ship was scheduled to leave from Khlong Toei Port in Bangkok at 14:00 (2 P.M.) so we had to head for the cruise ship after the visit the shopping complex. Thank for your kind review. Swai was very kind and helpful to me. He took care to show me important historical sights and to explain them to me. TOUR GUIDE RESPONSE: The trip on 9th January 2017 was guided to Ayutthaya Province and visited to Bang Pa In Palace (the summer palace of the royal family); having a local lunch nearby the river at Saithong Restaurant; visited to Wat Mahathat (the head of a Buddha statue under the large Bhodi Tree); the elephant campus and then to the ruins at Wat Chaiwatthanaram (the temple dedicated to the mother of the king, King Prasatthong). Thank for your kind review. We booked this tour for our first day in Bangkok. Great way to ease ourselves into our trip while learning some history of Thailand. Swai was prompt, polite and very attentive to our needs. He spoke English well and very knowledgeable. We really enjoyed our day! Thank you. TOUR GUIDE RESPONSE: Thank for your kind review. The trip was covered the most highlights in Ayutthaya including the Summer Palace; the historical park; the ruins of the old capital city and also some famous Buddhist temples. Swai provided us with an amazing tour of Bangkok and we saw more in six hours than most would be able to see in days because Swai knows how to plan a tour to meet your request and maximize your time. He was very professional and knowledgeable of the history of Thailand so it was a great experience. I would highly recommend him to anyone wanting to tour Bangkok. TOUR GUIDE RESPONSE: Thank for your kind review and comment. There are still a lot of attractions to visit and so many activities to join in Thailand. It will be very welcome to visit Thailand in the future trip. Swai made sure we got the most out of our time in Bangkok. A genuinely lovely man, nothing was too much trouble and he was very flexible to try and accommodate our needs. He was very knowledgable about everywhere we visited too so we learned a lot. Recommend Swai very very highly if you are coming to Bangkok. The air conditioned minibus was a godsend too! Thank you Swai - we had a great time and saw some amazing things we will never forget. TOUR GUIDE RESPONSE: Thank for your kind review. The trip was from the published package of 2 days service. The tour was guided on the area of the old Bangkok on the first day and to the destination of the floating market on another day. We visited to experience a lot about the locals. And it will be very welcome for you and family to visit Thailand again in the future. It was really great pleasure to guide during that time. Swai was a very helpful, enthusiastic and interesting guide. He had perfect English and we managed to fit so much into the day. I would highly recommend him to anyone visiting Bangkok for the first time. We had one day in Bangkok to see the Grand Palace, the canals, and Wat Pho. We had flown 24 hours, with a 15 hour time change, and were severely jet lagged. Plus it was 95 degrees and humid! Recipe for disaster. But Swai changed all that! With his good humor, deep knowledge of the city, excellent English and high energy--plus an air conditioned van--he gave us the gift of a magical and memorable first day in Thailand. This is my first tours by locals experience, and I will plan to have many more! TOUR GUIDE RESPONSE: So happy to hear from your kind respond. Hope to see you again in Thailand. Very knowledgaable and friendly guide. TOUR GUIDE RESPONSE: It was my great pleasure. And it is very welcome to visit Thailand again especially for you and your family. Very good, very patient and very very honest. We did not get a lunch that was covered in original schedule, he paid back without our asking for it. It is very rare & much appreciated. His English is good, he is patient with tourist and gives a good explanation as to were we were & what we were visiting. he went out of his way to accommodate our requests & stayed extra hours without complaint or charge. we liked him very much. TOUR GUIDE RESPONSE: It is very great pleasure to hear from your kind comment and thank you very much for your former booking. Hope to see you again in the future. We enjoyed our day with Swai. Swai was able to recommend a perfect day for our family based on our interest. We asked to visit local markets. Swai selected the perfect locations for us to visit to get a feel for living like locals. During our tour with Swai, we learned more about the that language and people than we did during any other of our tours with other guides. Swai was amazing with our children! He helped engage them based on their interests. This was a great day! TOUR GUIDE RESPONSE: So great pleasure to hear from you. And so happy to hear from your enjoying time during the trip. See you all again in Thailand in the future trip. Our group had Swai for a tour from our cruise port into Bangkok. From the moment he picked us up, he was all about the details. He had special snacks for us and made sure that we made drink stops so that we were always comfortable. There is much traffic to manage in this trip but Swai again was the utmost host. He bought fried bananas for us to share from street vendors and shared details of Thailand while we traveled along. TOUR GUIDE RESPONSE: So happy to hear from you. There are still a lot of attractions to visit in Thailand and very welcome you to visit for your future trips. Swai was the best tour guide we have ever had. He was great with our grandkids, attentive to our needs and professional at all times. Our visit to the Tiger Zoo was memorable! He was very knowledgeable and made sure we got seats to all the shows we wanted. On the way back to ship stopped at shops so we could get nappies for baby and see markets. Would thoroughly recommend him. Thanks Swai from the White/Thompson family from Brisbane. TOUR GUIDE RESPONSE: Thank for your kind review. It was so great pleasure to hear from you that the tour was memorable and happy for you and family. I was also happy to take care all of you too. Hope to see you all again in the near future. Thank you. What a great service it was. What an excellent guide he was. Swai was so fantastic. He was so gentle, friendly, smart and fun. He was so knowledgeable. I traveled all around the world and had got experienced many local guides, Swai was the best ever. TOUR GUIDE RESPONSE: With my pleasure. There are still more and more places to visit and you can plan your next trip. See you again in Thailand. Swai was great. He adapted the tour to the things we were interested in. He knew the ends and outs of the city very well. His driver was good as well. He related well to our 9 year old son. I thought it was interesting that he never sweated even though it was hot as heck that day. He was very professional and we enjoyed the restaurants that he took us to. Swai was wonderful. He was extremely friendly and attentive to all of our needs. We really enjoyed touring with him. TOUR GUIDE RESPONSE: Thank for your kind review. And welcome to visit Thailand any time in future. I arranged this tour for 2 of my customers and they received 5 star service and can't stop commenting on what a great time they had , Mr Swai English was excellent , the transportation was top quality as was the Hotel that was chosen . Pick up at airport and drop off back to Bangkok was punctual . Mr Swai's local knowledge and that of history was faultless Recommend as a 5 star tour . TOUR GUIDE RESPONSE: I have to say thank you for your kind review and comment. That was about the tour at Kanchanaburi Province for your former customized tour to the route of the Bridge on the River Kwae, the Death Railway & the Hellfire Pass. That's also my great pleasure on the tour service. Many thanks to Swai for a fantastic day. We learnt alot during a packed tour, Hellfire pass was very humbling being able to walk through where many servicemen lost their lives creating it. Other parts of the tour were great fun such as the boat ride and trying new foods. TOUR GUIDE RESPONSE: That's my great pleasure. The trip of Kanchanaburi Province was one of the highlight attractions of Thailand, there are still a lot for worth visit and it will be very welcome whenever revisit Thailand. Swai did an excellent job in a busy and hot city! In the middle of it all, he took us to a tranquil place for lunch, then showed us a huge, busy market. Swai was punctual, polite and concerned that we saw exactly what we wanted to see whilst enabling us to see so much more. We visited palaces, temples and were able to marvel at the different Buddhas and beautiful architecture as well as learning about the history of these amazing sights. He arranged lunch at a beautiful restaurant which allowed us to experience some excellent local food. TOUR GUIDE RESPONSE: The tour was for the highlights in Bangkok and there are much more for visit not even in Bangkok but around the country. So very welcome to revisit Thailand again in the future. Swai was very accommodating to all our requests and made our trip to Pattaya a very memorable and enjoyable one. TOUR GUIDE RESPONSE: That's so great pleasure. And also very welcome you all to revisit Thailand any time in the future, there are still a lot of attractions for visiting. We enjoyed our 2 days touring Bangkok with Swai. His English was very good and we packed a lot into the 2 days. We loved the floating market and all the palaces and temples. The only part of the trip I would not recommend was the canal tour on Bangkok. TOUR GUIDE RESPONSE: Thank for your kind review and comment. The tours of your visit were Bangkok highlights and the Floating Market. There will be more attractions to visit around Bangkok and within Thailand. And welcome you to revisit in the future. TOUR GUIDE RESPONSE: So happy to hear from you. It was my great pleasure from your kind review. And thank you so so much for your kind support. Thoroughly enjoyed our day in Bangkok with Swai. Warm and personable guide who accommodated our every need. Both his knowledge of and love for his city were apparent. He customized the day effortlessly. TOUR GUIDE RESPONSE: That is so great pleasure to hear from you. Very welcome for you all to revisit Thailand anytime. We chose Swai to do the River Kwai Tour and we were not disappointed. We highly recommend Swai for any tours. Swai's devotion to his job and his love for his country is apparent with all the information he gave us during the tour. Swai was waiting for us at Laem Chabang port when we docked. The tour was fantastic we saw and learnt much more than we expected and the scenery was lovely. Thankyou Swai for a very informative and memorable tour. TOUR GUIDE RESPONSE: That's so great pleasure from your kind review. And also so happy to hear from your enjoyableness on the trip. It is very welcomed you to revisit Thailand in the future. Swai is an excellent guide - it was our second day with him and we really enjoyed our time in Thailand. He is extremely knowledgeable and very accommodating!! TOUR GUIDE RESPONSE: So great pleasure. And really welcome you all to revisit Thailand again in future. Swai is very professional, well spoken with good English and provided us with a lot of knowledge about the early kingdoms of Thailand. Especially nice was the variety of foods he introduced to us at lunch. TOUR GUIDE RESPONSE: That was all my great pleasure of your kind comment. And also very welcome you to visit Thailand any time in the future. Swai was an excellent, excellent ambassador to Bangkok. He shared himself and his love for his city. He had a wonderful sense of humor and a great command of Thai history. He went out of his way to male sure we found an outf o way restaurant on his time. TOUR GUIDE RESPONSE: Thank for you comment. That's all really my best pleasure. Hope you all enjoy the trip during the time visiting Thailand and very welcome you all to visit Thailand again in the future. Swai was excellent, couldn't do enough for us. Everything went so smoothly from the pick-up at the hotel in Bangkok at 6am to our return at 8pm. We visited the DonRak cemetery first then on to the bridge and museum. Later on the train for anhour then had lunch outdoor, really great. Later went on to the Hellfire Pass and museum before returning to Kamchanaburi for a boat ride on the Kwai. A full and tiring day but it was the highlight of the trip. The whole day was exceptional. Thankyou Swai. TOUR GUIDE RESPONSE: That's all my great pleasure. Very welcome to visit Thailand again any time in the future. This was the second tour I had with Swai. This time was just as great as the first. If I am able to return to Bangkok, I will not hesitate to request him as a guide again. The Proud Capital City Tour was great. He was able to help me better understand and appreciate the culture of Thailand. thank you for a job well done!! TOUR GUIDE RESPONSE: That's really great pleasure. There are still a lot for worth visit Thailand. Whenever coming, it always welcome with best regards. Absolutely five stars for Swai!! we had a great time!! He has tremendous knowledge about the history and culture and street information. I learned so much!! He is very enthusiastic about his culture. He is very considerate, very pleasant!! I had many tour guides before. But he is a gem!! Our trip to Bangkok was so nice and smooth because of him!! I truly thankful to your website, With this positive experience, I am definitely use it again in other cities. TOUR GUIDE RESPONSE: Dear So Hyang Park; That was so surprised you are still in Bangkok for kind review to me. Thank you. That was also absolute my great pleasure to you all. There are still a lot of places to travel to whenever you consider to revisit Thailand again with very welcome to you all. Best regards, Swai H.
He was great, knowledgable and showed us some wonderful hidden gems we will always remember. We also had a super driver. TOUR GUIDE RESPONSE: Dear Arthur von Wiesenberger; It was really great pleasure to do tour service to your family. There are still a lot of attractions to visit within Thailand and it is very welcomed you all whenever coming to visit Thailand. Best regards, Swai H.
Anyone visiting this region should not miss the opportunity to hire this guy. My wife and I had a great day with him he is very knowledgeable about his country and made sure we had a full and interesting day. We highly recommend him. TOUR GUIDE RESPONSE: Dear Neil Bryson; That's really great pleasure. Hope to see you again in Thailand in the near future. Best regards, Swai H.
This was everything I wanted. My goal was to see the area where my father destroyed the wooden Bridge Over the River Kwai in WWII. I also was able to ride over the train tracks the POW's had built. The museum at Hell Fire Pass was amazing. I truly felt I was walking on sacred ground. Swai was an excellent guide and I hope he will be my guide again when I return to Bangkok in August. TOUR GUIDE RESPONSE: Dear Kathy; It was more than my pleasure you were enjoyed with the trip. We started from the POW cemetery and continued to the local museum (almost ruined museum). Then the chance of experience the rail track of the Bridge on the River Kwai. Finally, we visited the museum of Hellfire Pass Museum. This route was about a part of WWII story. And it is really welcomed you to visit Thailand again in the very near future. I would try my best of the tour service for your destined places. Best regards, Swai H.
Swai was an excellent guide from beginning to end. I was quite impressed with how above and beyond he went to cater to my requested itinerary. As a history teacher I was pleased to hear detailed descriptions that were known by Swai and not some memorized scipt. I can tell Swai loves Thailand and enjoys showing travelers the marvels of this great place. I learned a lot from Swai and would recommend him to anyone. I embrace serendipity while traveling and Swai was happy to accommodate. TOUR GUIDE RESPONSE: Dear James Hodges; It is really my great pleasure from your kind response comment. Apart from my past experience as a school teacher which I had to keep a lot details on the historical information, I still read, learn, explore and update every concerned to the tour information together with my own background just to give all details properly. Hope you enjoy the trip and very welcome to Thailand any time you would like to revisit in the future. Best regards, Swai H.
We chose Swai because he was local and spoke fluent English, and could not have chosen better. We only had two days and were accompanied by our daughter and baby grandson the first day. Much time was spent viewing the Royal Palace and selected Bangkok temples at which Swai delighted us with his extensive knowledge of Thai history. Lunch at a small family restaurant was another highlight with excellent food reasonably priced. Nothing was too much trouble. Swai was always kind, considerate and respectful. TOUR GUIDE RESPONSE: Dear Alastair Coles; It is really my great pleasure you were happy during the trip even the weather was too hot during the day time. I still remember you all so nice during the visiting time, Alastair, Barbara, Amy even the little boy Max. I hope to show you all around more for your next chance. Best wishes to you all, Swai H.
The 2nd day at Ratchaburi Province, 90 minutes away from the centre, was also impressive. My daughter and baby grandson had gone home so we were able to sample fresh coconut before taking an exciting boat ride to a nearby sugar farm and floating market, both vibrant and enticing. The day ended at the 'crazy market' next to the railway line in Mae Klong District, where we enjoyed an excellent lunch cooked on the street in front of us. Swai is an excellent host and guide who I'd thoroughly recommend to all. TOUR GUIDE RESPONSE: Dear Alastair Coles; So happy to hear from you about the enjoying trip you were impressive, me too. That was all I tried my best to show you around and tasted some local food which I always concern and consider for the hygienically meal and beverage, all I recommended were clean and safe for trying. The weather was too hot that day, let try some other cool season during the end of the year with very very welcome for your next chance of the trip. Best wishes, Swai H.
TOUR GUIDE RESPONSE: Thank you Andras. The trip on that day was started by visiting the local ceremony of the boys turning to be ordained as a Buddhist priest at Wat Larnboon, the Temple of the Golden Buddha, Golden Mount, the Royal Grand Palace and the Temple of the Emerald Buddha, Wat Aroon, Wat Pho, Vimarnmek Mansion and one Thai traditional meal. Hope you enjoyed all details along the trip. Regards, Mr.Swai H.
Our guide did a great job! TOUR GUIDE RESPONSE: Thank for your kind response. Hope you enjoy and have fun during the trip and hope to see you again in Thailand in the future. Highly recommended! Swai was very respectful and knowledgeable, and made sure we got to the places we wanted to visit. He took us to one of his favorite noodle carts and ordered lunch for us, then selected delicious Thai dishes at a restaurant for our dinner. He was not available during our second day in port, but arranged for his driver (who was also excellent) to take us around, while Swai kept in phone contact with him. Thank you Swai! TOUR GUIDE RESPONSE: Dear Susan Woo and all of the group; Thank for your kind comment, it was so good that you all enjoyed the trip happily. I always do my best on the tour service and share Thai custom, tradition and culture to all customers. All of you were so so nice along the trip. There are still a lot of attractions and activities in Thailand even in Bangkok. Hope to see you all in Thailand again in the future, so very welcome to you all. Warm regards; Mr.Swai H.
We had a great day with Swai and his very talented driver. Tour was better than we could have reasonably hoped. The quality of the van was also superb, and I am fussy! TOUR GUIDE RESPONSE: Dear Kerr Brown; It is my great pleasure. Let's use this opportunity to bless you good luck with best wishes, Merry Christmas and Happy New Year. Very well done. Guide was very energetic and knowledgeable. TOUR GUIDE RESPONSE: Thank you Alison. Hope you will come back to visit Bangkok again with very warm welcome. Swai was very cordial to accept my late booking. My family and I had a great time with him and the driver. I lived in Thailand during the 70's and know Bangkok well, but wanted someone knowledgeable to explain the historical sites to my family. Swai did an excellent job. We visited many sites in Bangkok and were exhausted at the end of the day - just what we wanted. He is a great guide and I will recommend him to others. TOUR GUIDE RESPONSE: Dear Jon Clyde; It's really my great pleasure. So proud you have known Thai details very well and also very welcome to Thailand any time, I will try my best to share about Thai tradition, custom and culture as well as some information of brief history. Looking forward to seeing you all in Thailand in the near future. West wishes to you all, Swai H.
TOUR GUIDE RESPONSE: Thank for your comment, Carina. You know it is coincident I was just on searching some shops of stewed pork legs you requested earlier which we visited one. I found some of really nice of them, let's try some others next chance. It is my great pleasure to do best service to you all including your cute twins. Take care and best wishes to you all. Our guide and driver were very courteous. Their main concern was to make all of us enjoy the trip. Swai discussed Thai history and culture in great detail. Everyone had a great time including my 87 year old mother who was in a wheel chair. TOUR GUIDE RESPONSE: Dear Alexandra; Really be happy to hear from you that it was enjoyable during the trip to Ayuddhaya. It was also my great honor too to have a chance doing tour service to all of you. Hope all of you have a wonderful time during the trip in Ayuddhaya. And also hope to see all of you in Thailand in the near future. Thank you. Sorry for the late review. Can not say enough good things about Swai. We were a large group, poor Swai must have felt like a cattle herder with us all wandering off in different directions at the market. He was patient with us, always smiling and happy to answer any questions. Took the time to talk to every one individually. Had a very enjoyable day, will certainly use him again in the future. TOUR GUIDE RESPONSE: Thank, Alicia, for your review. I was certainly happy to hear from you about you and the group to have enjoyable time during the trip in Thailand. And I will be very very welcome all of you to visit Thailand again in the future. Swai was absolutely fantastic! He was extremely professional, spoke excellent English, was passionate about showing us what we wanted to see, added lots of local color to the trip. We highly recommend him. Plus he was a lot of fun. TOUR GUIDE RESPONSE: Dear Mary; It was so great pleasure. I always try to do my best service on the tour. Also, it was my great chance of tour service to your group. See you again in Thailand. Swai was very professional, prompt and knowledgable. He was enthusiastic and catered the tour to our needs and would have guided us longer than the hours we had paid for but we were too tired. The only thing we had a little trouble with was his strong accent, some people in our group had some difficultly understanding him. I would recommend his service to friends as he was a good guide and really helped us so that we were more familiar with Bangkok and local customs. TOUR GUIDE RESPONSE: Hello Kelly, Hope you and the group had wonderful time duing the trip in Thailand. And also hope to have a great chance to do my best service to you and the group. See you again next chance in Thailand. TOUR GUIDE RESPONSE: Hello Adrienne; It is really great pleasure to do the tour service to you and the group. The happiness to all of you during being in Thailand is my main aim. Hope to see you again in Thailand.